Flying Bird Wind Spinners by Premier Designs. 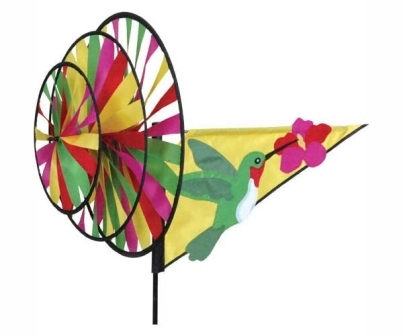 Premier Design presents a new line of value-priced Accent Wind Spinners for the garden. Smaller and less detailed than our Wind Garden spinners, but just as eye-catching, new Premier Design Accent Wind Spinners utilize brand new hardware and fabric. SunTex is a revolutionary 210D polyester fabric with added density available only from Premier. It provides bright colors, durability and UV resistance that is far superior to other spinner fabrics on the market, and second only to SolarMax. For customers who love Premier Design wind spinners but shy away from premium Wind Garden pricing, our new Accent Wind Spinners provide an affordable, yet durable, alternative.